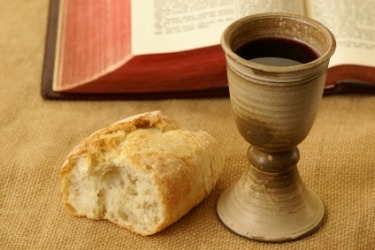 One of the most important of our services is Holy Communion, also known as Eucharist. This is a ceremony derived from the last supper which Jesus held with his followers on the night before his arrest and execution. We as Christians believe that this ceremony creates a special sort of contact with God, which helps to strengthen us as Christians. Holy Communion involves the giving out of bread and wine which has been consecrated, or made holy, with special prayers. In our church we use real bread; in others they may use special wafers which look like slices of glue-stick. We are all invited in turn to come up to the Alter to receiving the bread from the vicar or his nominated assistants. The wine is offered from a chalice, the ceremonial goblet containing the wine. If you do not wish to partake of bread and wine, you can signify that you only wish for a blessing by holding you arm by the side of your body.